Chasing 173 for victory, South Africa opted for a new ploy and sent David Miller (24) to open the innings. They didn't get off to a great start though, with in-form Reeza Hendricks (7) skying a catch off Bhuvneshwar Kumar (2-24). 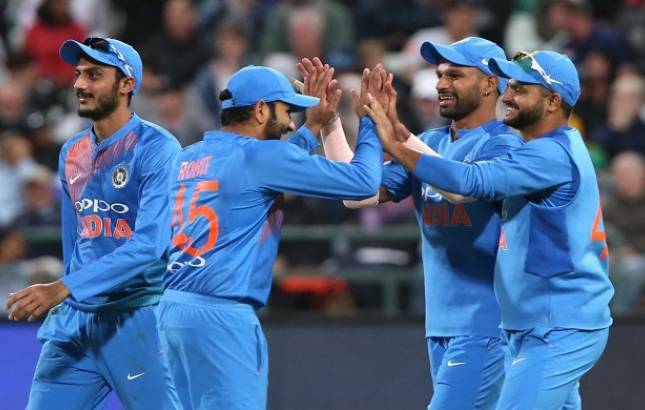 India brought curtains on a highly successful South Africa tour by clinching the Twenty20 series 2-1 with a comfortable seven-run win in the deciding third match at Newlands on Saturday. India’s challenging tour had started at this very ground on January 5 and it culminated with a convincing win, which came in the absence of skipper Virat Kohli who did not play today’s match due to stiff back. India got a flourishing start with Suresh Raina (43 off 27) clobbering South African bowlers but the hosts succeeded in straight-jacketing the batsmen by taking the pace off the ball as visitors settled for 172 for seven. The visitors choked South Africa with a remarkable disciplined bowling effort in Powerplay overs as they restricted the hosts to 165 for six to not only end the challenging tour on a high but also register maiden T20 series win on South African soil. Home skipper JP Duminy (55) and debutant Christiaan Jonker (49) showed stomach for fight but their charge came too late. India had recorded a dominating 5-1 win series win in the One-dayers and thus the team stamped its class in the white-ball cricket after losing the Test series 1-2. Bhuvneshwar Kumar took 2-24 and was assisted by and Hardik Pandya (1-22) and Suresh Raina (1-27). This was after Shikhar Dhawan top-scored with 47 off 40 balls and put on 65 runs for the second wicket with Raina to spearheaded the Indian innings. But the visitors never really hit fifth gear and the innings was patchy throughout as compared to the previous two games. Earlier, put into bat for the third consecutive time in this T20Is series, Rohit Sharma (11) was off the blocks quickly taking 13 runs off Chris Morris (2-43) first over. Junior Dala (3/35) though got him out for the third time in three matches, trapping Rohit lbw on the third ball of his first over. The batsman chose not to review even as the umpire did check for a no ball. Raina though upped the tempo immediately after coming to the crease. With a flurry of boundaries, he and Dhawan took India to 57/1 in the first six overs and their 50-partnership came off 37 balls. South Africa changed their bowling around quite a bit and JP Duminy (0-22) bowled a tight first spell that dropped India?s run-rate down to 8.5/over before the half-stage of their innings. It also didn?t help that Raina holed out off Tabraiz Shamsi (1-31) and was caught at long on. Dhawan wasn't timing the ball too well, and couldn't make a tall score despite gaining two lives. Shamsi had dropped him twice, on nine in the sixth over off Morris at short third man and then at 34 in the 13th over off Aaron Phangiso (0/13). He helped India past 100 in the 12th over even as the run-rate was maintained over 8 per over. But now the visitors were looking to accelerate, evident from Dhawan?s stroke play and Manish Pandey's (13) efforts. The duo put on 32 runs for the third wicket before Pandey was caught in the deep off Dala in the 14th over. It became a quick double-blow as Dhawan too departed 12 balls later, run-out off Dala as he was involved in a mix-up with Hardik Pandya (21 off 17 balls). Pandya had been sent up to provide acceleration to the innings but it never really came as he and MS Dhoni (12 off 11 balls) pushed the score past 150 in the 19th over. But a flurry of wickets came late in the innings. Dhoni, Pandya and Dinesh Karthik (13) fell in the space of 8 balls as South Africa topped up a controlled display with the ball. Kumar and the returning Jasprit Bumrah (1-39) held things tight in their initial spells, while even Shardul Thakur (1-35) kept control of the scoring rate. So much so, the Proteas only managed to score 25 for one in the first six overs. It was all to do for them as Suresh Raina (1-27) came up to bowl. Miller opened up, as did Duminy at the other end as they added 35 runs for the second wicket but consumed 38 balls in doing so. Raina picked up the wicket of Miller just before the half-way mark, as the batsman was caught slogging in the deep. The big moment came when Hardik Pandya (1-22) dismissed Heinrick Klaasen (7) cheaply as Kumar took a sharp catch at mid-off. Duminy then took the onus on himself and started hitting out. Axar Patel (0-16) was reserved for special attention and he proved expensive in the only over he bowled as Duminy scored his 11th T20I half-century off 38 balls. Duminy and Jonker (49 off 24 balls) added 39 runs for the fourth wicket, before Thakuar snapped up the skipper to set the Proteas back further. Bumrah bowled Chris Morris (4) to further hurt the chase. But the debutant had other plans as he launched a measured attack on the Indian bowling. With 53 needed off 18 balls, he took 18 runs off Thakur's 18th over and then smacked Bumrah for another 16 in the penultimate over, putting up 51 runs off just 22 balls with Ferhaan Behardien (15 not out). The equation came down to 19 off the last over, but Kumar held things tight and bowled India to a series win.